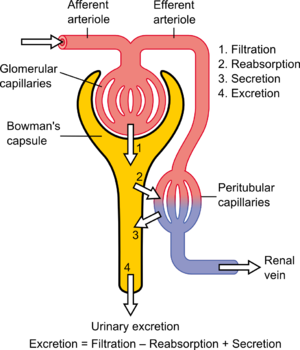 This illustration demonstrates the normal kidney physiology. It also includes illustrations showing where some types of diuretics act, and what they do. The functions of the kidney can be divided into three groups: secretion of hormones, gluconeogenesis and extracellular homeostasis of pH and blood components. The nephron is the functional unit of the kidney. Secretion of renin, which is a key part of the renin–angiotensin–aldosterone system. Secretion of the active form of vitamin D (calcitriol) and prostaglandins. The kidney in humans is capable of producing glucose from lactate, glycerol and glutamine. The kidney is responsible for about half of the total gluconeogenesis in fasting humans. The regulation of glucose production in the kidney is achieved by action of insulin, catecholamines and other hormones. Renal gluconeogenesis takes place in the renal cortex. The renal medulla is incapable of producing glucose due to absence of necessary enzymes. The body is very sensitive to its pH. Outside the range of pH that is compatible with life, proteins are denatured and digested, enzymes lose their ability to function, and the body is unable to sustain itself. The kidneys maintain acid-base homeostasis by regulating the pH of the blood plasma. Gains and losses of acid and base must be balanced. Acids are divided into "volatile acids" and "nonvolatile acids". See also titratable acid. The major homeostatic control point for maintaining this stable balance is renal excretion. The kidney is directed to excrete or retain sodium via the action of aldosterone, antidiuretic hormone (ADH, or vasopressin), atrial natriuretic peptide (ANP), and other hormones. Abnormal ranges of the fractional excretion of sodium can imply acute tubular necrosis or glomerular dysfunction. Although the strictest sense of the word excretion with respect to the urinary system is urination itself, renal clearance is also conventionally called excretion (for example, in the set term fractional excretion of sodium). The blood is filtered by nephrons, the functional units of the kidney. Each nephron begins in a renal corpuscle, which is composed of a glomerulus enclosed in a Bowman's capsule. Cells, proteins, and other large molecules are filtered out of the glomerulus by a process of ultrafiltration, leaving an ultrafiltrate that resembles plasma (except that the ultrafiltrate has negligible plasma proteins) to enter Bowman's space. Filtration is driven by Starling forces. The ultrafiltrate is passed through, in turn, the proximal convoluted tubule, the loop of Henle, the distal convoluted tubule, and a series of collecting ducts to form urine. Tubular reabsorption is the process by which solutes and water are removed from the tubular fluid and transported into the blood. It is called reabsorption (and not absorption) both because these substances have already been absorbed once (particularly in the intestines) and because the body is reclaiming them from a postglomerular fluid stream that is well on its way to becoming urine (that is, they will soon be lost to the urine unless they are reclaimed). Reabsorption is a two-step process beginning with the active or passive extraction of substances from the tubule fluid into the renal interstitium (the connective tissue that surrounds the nephrons), and then the transport of these substances from the interstitium into the bloodstream. These transport processes are driven by Starling forces, diffusion, and active transport. Both hormones exert their effects principally on the collecting ducts. Tubular secretion occurs simultaneously during reabsorption of Filtrate. Substances, generally produced by body or the by-products of cell metabolism that can become toxic in high concentration, and some drugs (if taken). These all are secreted into the lumen of renal tubule. Tubular secretion can be either active or passive or co-transport. Substances mainly secreted into renal tubule are; H+, K+, NH3, urea, creatinine, histamine and drugs like penicillin. Tubular secretion occurs at PCT and DCT; for example, at proximal convoluted tubule, potassium is secreted by means of sodium-potassium pump, hydrogen ion is secreted by means of active transport and co-transport, i.e. antiporter, and ammonia diffuses into renal tubule. A simple means of estimating renal function is to measure pH, blood urea nitrogen, creatinine, and basic electrolytes (including sodium, potassium, chloride, and bicarbonate). As the kidney is the most important organ in controlling these values, any derangement in these values could suggest renal impairment. Volume of blood plasma delivered to the kidney per unit time. PAH clearance is a renal analysis method used to provide an estimate. Approximately 625 ml/min. (HCT is hematocrit) Volume of blood delivered to the kidney per unit time. In humans, the kidneys together receive roughly 20% of cardiac output, amounting to 1 L/min in a 70-kg adult male. (estimation using creatinine clearance) Volume of fluid filtered from the renal glomerular capillaries into the Bowman's capsule per unit time. Estimated using inulin. Usually a creatinine clearance test is performed but other markers, such as the plant polysaccharide inulin or radiolabelled EDTA, may be used as well. Measures portion of renal plasma that is filtered. The volume of blood plasma that is cleared of solute-free water per unit time. ^ Gerich, J. E. (2010). "Role of the kidney in normal glucose homeostasis and in the hyperglycaemia of diabetes mellitus: Therapeutic implications". Diabetic Medicine. 27 (2): 136–142. doi:10.1111/j.1464-5491.2009.02894.x. PMC 4232006. PMID 20546255. ^ Gerich, J. E.; Meyer, C.; Woerle, H. J.; Stumvoll, M. (2001). "Renal gluconeogenesis: Its importance in human glucose homeostasis". Diabetes Care. 24 (2): 382–391. doi:10.2337/diacare.24.2.382. PMID 11213896.